Joana Paupério, PhD., is Post-Doc Researcher at the Research Centre in Biodiversity and Genetic Resources (CIBIO), Portugal. 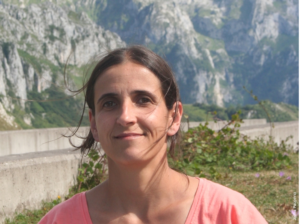 She is involved in several projects related with the development and application of molecular tools for the conservation of small mammals, while integrating biological and landscape information. Recently, she has joined a project on environmental metabarcoding. Research Centre in Biodiversity and Genetic Resources, University of Porto, Portugal. Collaborative processes are fundamental to address global issues as environmental change and its threats to biodiversity. Small mammals are key components in ecosystems and, although almost 20% of the species are of conservation concern, they are often neglected in conservation planning. We showcase research we performed in collaboration with other international teams, both regarding sharing of samples, as well as the exchange of knowledge, focusing on the conservation genetics of small mammals for assessing species diversity, evolutionary history, population structure and connectivity. One of our focal species is the Cabrera vole (Microtus cabrerae), a near-threatened species, endemic to the Iberian Peninsula. We performed genetic analyses of tissues and non-invasive samples to determine its phylogeography, estimate the population size and establish kinship levels and connectivity. In collaboration with Cornell University, we used genomic tools for landscape genetics and for defining conservation units, and we also optimized the use of high-throughput sequencing (HTS) to non-invasive samples. Another target species is the field vole (Microtus agrestis), considered a widespread species in Europe but that our work has shown to be composed by three Evolutionarily Significant Units. In collaboration with European Universities and Natural History museums through the sharing of samples, we have used an integrative approach, focusing on genetic, morphological and karyotypic data to understand the evolutionary history of the species complex and its level of differentiation. Overall, through collaborations, we were able to develop integrative projects, with larger sample sizes and with the application of recently developed high throughput techniques. These collaborative projects allow a clearer understanding of the species population status, being therefore able to provide better guidance for their conservation.